I headed to the Coal Yard Cafe after I walked the dogs late this morning, to get something to eat and get some stuff done on my laptop. As I walked over from my car, I got a whiff of maple syrup and sausage, and I decided I needed to have both in my life! I told the counter person I had smelled maple syrup and sausage, and I would like some of those, please! She laughed and asked if that was all I wanted. I decided I should have the stuffed french toast that was on the specials board in between them. 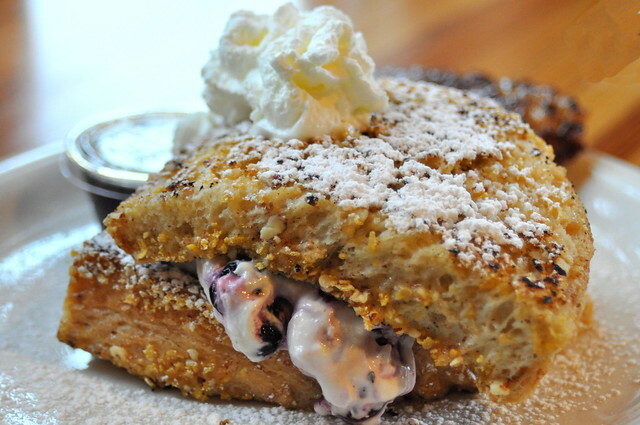 The corn flake and almond crusted french toast stuffed with cranberries and blueberries really reminded me of the stuffed french toast at Andy's 3rd Street Cafe that belmikey commemorates every summer. Not really conducive to getting work done, but an awfully satisfying start to the day!